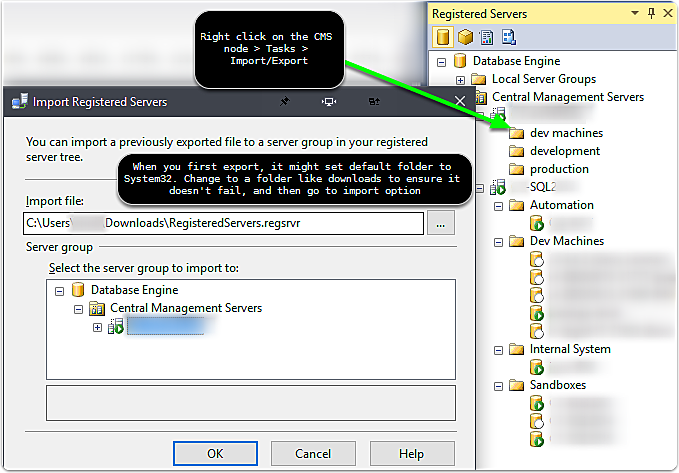 I’ve used Central Management Server registered servers in SSMS for primarily one purpose, saving connections. :-) This is definitely not the intended usage. As I’ve explored the benefits of using this a little more, I put a few notes together to help share the concepts I came across. 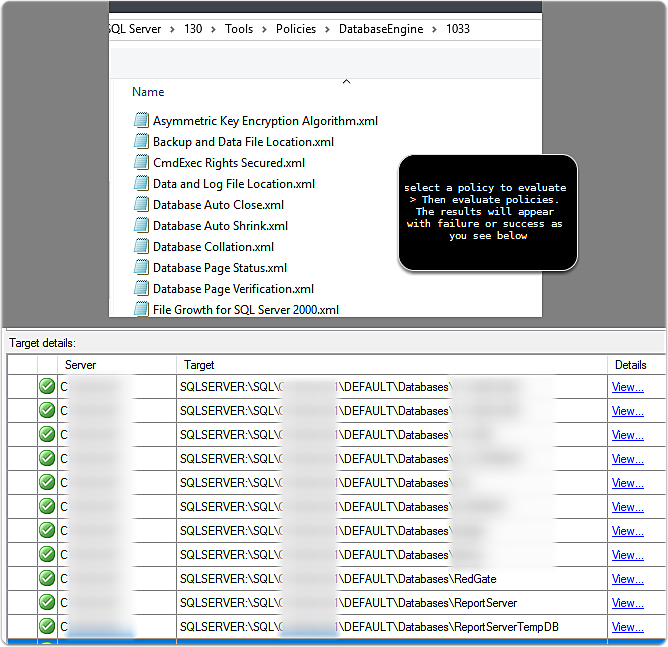 I was brand new to this feature in SQL server, and found some of the functionality pretty powerful, especially if you are in an environment that has a lot of servers to manage and ensure consistent configuration among all of them. If you need to move your Central Management Server (CMS) entries to a new CMS, then use the export and import functionality located under the CMS > Tasks context menu. 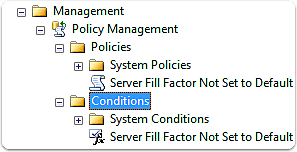 From the CSM context menu you can perform some nice functionality such as start, start, restart of SQL services, view error logs, and even pull up the SQL configuration manager for that instance! Take advantage of this to easily adjust settings across instances without having to log into remote machines. There are a few different types of policy behaviors to know about. 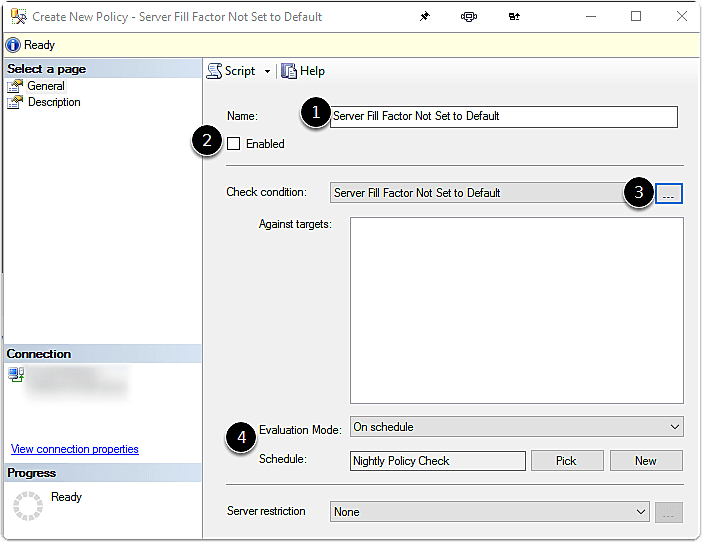 From MSDN article Administer Servers by Using Policy-Based Management I found that there were a few ways the evaluation of a policy is handled. Add new condition, there is a large list of policies to evaluate. You can detailed information on them on MSDN here. You’ll see a huge list of Facets to evaluate and then you can easily setup logic to evaluate this. 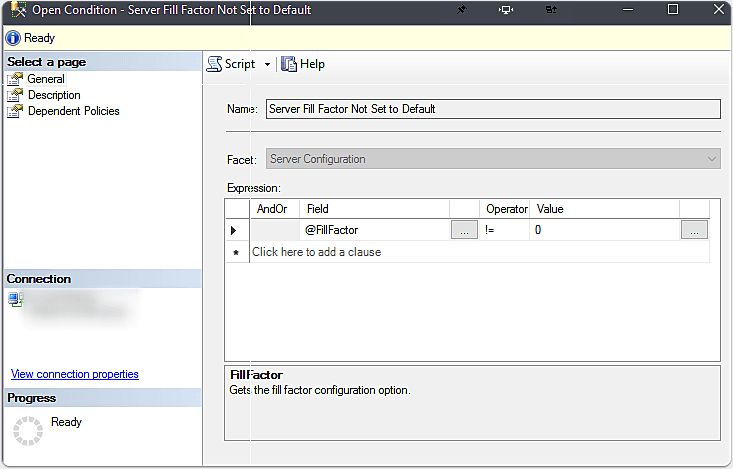 In this case, I linked back to my favorite resource for server configuration… the Ozar! Providing some detail back on this could be great for quickly providing details later back to someone reviewing the results. For all this hard work, you’ll get two fancy new icons in object explorer. With this work, I’m thinking saving your policies for backup with scripts would be a great idea…. scripting this would be much faster than all these steps to check one setting. I wish the dialogue had been focused on setting up multiple conditions quickly instead of all that work for a single Fact to be evaluated. My first run gave me a failure, despite to my eyes being the right match. I had to change my approach from being @FillFactor != 0 to being Policy should be @FillFactor = 0 and it would pass, else it would fall. I was thinking in reverse. MSDN indicates to be aware that: IMPORTANT! 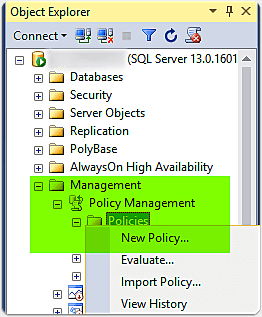 The functions that you can use to create Policy-Based Management conditions do not always use Transact-SQL syntax. Make sure that you follow the example syntax. 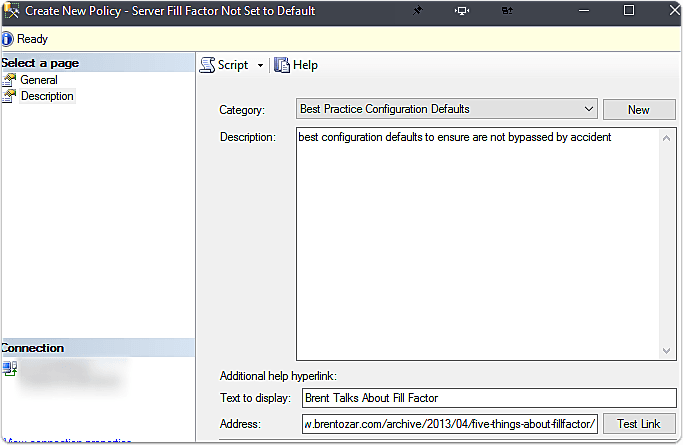 For example, when you use the DateAdd or DatePart functions, you must enclose the datepart argument in single quotes.